So far, we've organized four "browsing sessions" for our Promise of Poetry Project. We'll have one or two more before the semester break. 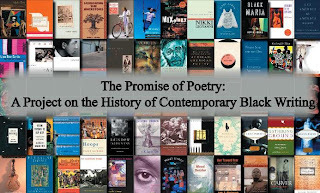 The most exciting aspect of the project has been the role we've played in connecting about one hundred college students with volumes of poetry by African American poetry. Aside from Langston Hughes, the poets in our collection are almost always unfamiliar to the participants. So we're hopefully doing some good by bringing a broader range of poets to their attention. During our browsing sessions, we ask readers to provide a blurb for the book they chose, and we ask them what they think would make African American poetry more appealing to general readers. A majority of our respondents have explained that if the poems "related" more to the contemporary concerns of readers then more people would read poetry. As one of the readers noted, "Too many of the poems aren't relate-able. If it related more, people would read more." Several readers have made similar points. We're still trying to decide how to view those versions of the "relate-able" argument. On the one hand, I understand where they're coming from. At the same time, I'm aware that there are all kinds of "relate-able" African American poets and poems out there. So there are likely additional things that hinder us from knowing about more poets and their work. Whatever the case, the results from our Promise of Poetry questionnaires are providing us with important insight about contemporary poets and potential readers.